1. 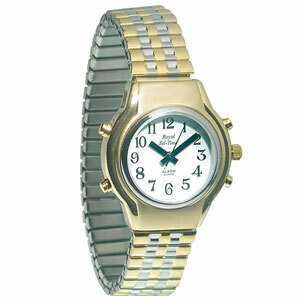 Polished Finish watch with White Dial & 1-12 Black Numbers, time announcement, alarm, calendar, timer and Expansion band. 2. Polished Finish watch with White Dial & 1-12 Black Numbers, time announcement, alarm, calendar, timer and Leather band. 3. Matte Finish watch with White Dial & 1-12 Black Numbers, time announcement, alarm, and Expansion band. 4. Matte Finish watch with White Dial & 1-12 Black Numbers, time announcement, alarm, and Leather band. 5. Matte Finish watch with White Dial & 1-12 Black Numbers, time announcement only and Expansion band. 6. Matte Finish watch with White Dial & 1-12 Black Numbers, time announcement only and Leather band.